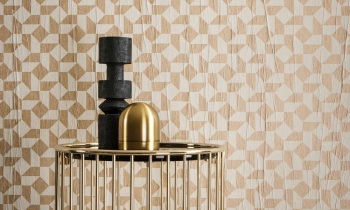 A combination of avant-garde textiles and elegant, pleated wallcovering. 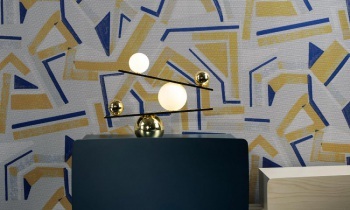 Abstract graphic patterns, playful and expressive colours, and a luxurious touch, all inspired by ‘modern painting’. A hint of Italian with a dash of vintage. The choice of materials is unique and contemporary. Matte or glossy. Experimental and technical. Added value in both look and feel. Mira is pure luxury. A finely pleated non-woven with the compact folds running horizontally. It looks like waves. The ‘crest of the wave’ is given a layer of shine using metal foil and resulting in a refined look. It’s quite high-tech. Plex, Latin for ‘pleat’, is the timeless variant from the collection. This contemporary, matte version is made of non-woven that has been irregularly creased with a pleat running vertically. The pleats are completely random and vary in intensity. Strips of stacked geometric shapes in contrasting colours, looking almost as if patterns have been cut up and shifted around. Mostly straight and sloping lines, with the occasional circle or part of a circle. Modernist is finished with a thin layer of lacquer, which gives the entire surface a subtle gloss. Printed on the plain, Plex. A rhythmic tiled pattern. 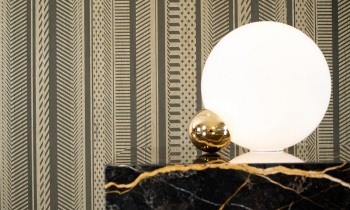 Tessella invokes Greek and Roman Antiquity, where varied coloured blocks of glass, stone or marble were pieced together to create a mosaic figure. The whole thing is an optical challenge: here you see depth, there relief. 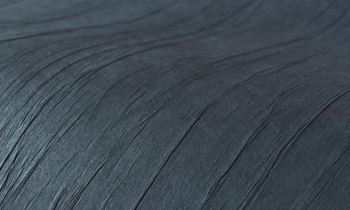 Tessella is a combination of matte and metallic inks printed on the plain, Plex. 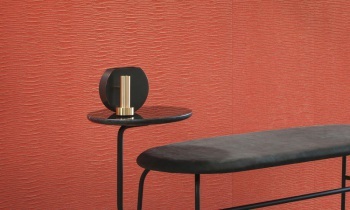 Traverse creates an intriguing play of vertical lines subtly interrupted by the vertical pleats of the plain, Plex. Smaller and repetitive prints are occasionally alternated with a solid line. An accent layer of glossy metallic ink provides the ‘special effect’ in gold or silver. 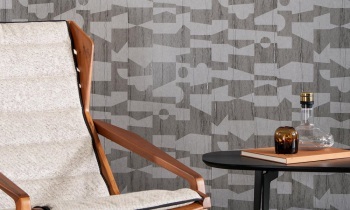 Expressionist, printed on a high-tech mesh textile, invokes ‘modern painting’ and stimulates all the senses. The relief, the texture, the flexibility of the fabric… an unconventional material in an explosive colour palette with bold combinations.